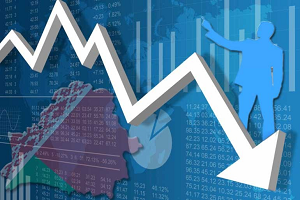 On 3 January 2017, The Eurasian Development Bank​ announced that Belarus is the only economy among CIS countries with a forecasted GDP decline in 2017. Meantime, the biggest problem of 2016 remains unresolved – on 28 January 2017, the Deputy Prime Minister of Russia Arkady Dvorkovich once again raised the bill for Belarus's supposed oil-gas debt. In this light, the authorities are trying to find a path to new external markets by intensifying negotiations on WTO accession. According to official forecasts for 2016, recovery should be on the way. Instead, the economy has remained unhealthy: the GDP contracted by 2.6 per cent in 2016 and will continue down this path in 2017, according to the Eurasian Development Bank. Industrial production fell by 0.4 per cent, year on year; investment in fixed capital collapsed by 17.9 per cent (see Figure 1). Thus, economic output has decreased for the second straight year and the pain will almost certainly extend into 2017. This is primarily because Russia (as the main export market) will not make a strong recovery. Moreover, Belarus still struggles with weak internal demand and poor productivity growth. Belarus's industrial sector, weighted down by debt, will still generate losses in 2017. As a result, the National Bank (NBB), searching for more ways to jump start the languishing economy, will lower the interest rate even further. However, the banking sector, struggling with the NBB's intention to decrease credit rates, will stay in the 'red zone' due to a possible repayment crisis of bad loans generated by indebted 'giants' and excessive directed lending in previous years. As a result, the subsequent drop in investment spending will cause an additional downturn in the economy. Given such uncertainty, businesspeople will also think twice before expanding their operations. What's more, by the end of 2016 the number of entrepreneurs in Belarus had decreased by 3.1 per cent. The Chairman of the NGO Perspective, Anatoly Shumchanka, reckons that the reduction in their numbers reflects the generally bad business environment, a good business environment is needed to start businesses and work without excessive administrative and fiscal obstacles. The lack of incentives for development means the absence of a safe path to carry out the activity. Due to the economic problems of companies, the real income of households contracted by 7.5 per cent year on year in 2016, suggesting that people will spend less on basic goods in 2017 as well. However, the worst-case scenario will occur if the government decides to increase directive average wages. According to the new Head of the Presidential Administration, Natalia Kochanova, the task of increasing the average wages up to the equivalent of $500 still remains unquestionable. The authorities believe that Belarusian consumers will increase their purchases in stores and the decrease in spending which occurred in 2016 will not happen again. However, the implementation of such a stimulus plan would once again lead to a sharp depreciation of the Belarusian ruble and subsequently, a significant decline in real incomes of people at risk. First, because the expectations of Belarusian consumers strongly correlate with the assumption that directive wage increase will lead to a devaluation of the Belarusian ruble. Thus, they will not spend their new money on products and services, but will put additional US dollars in their pockets, thus reinforcing the power of dollarisation in the country. Second, increasing costs of utilities will keep consumption at its lowest level for nearly a decade. Finally, the government and enterprises have no extra money to pay the bills for higher wages. Therefore, the only way to increase wages without increased productivity is the power button on the printing machine at the mind, resulting in 'great devaluation' again. The government forecasts positive economic growth in 2017 based on increased agricultural exports and a long-awaited end to the wrenching recession in Russia, Belarus’s biggest trading partner. However, neither seems assured. Russia’s strong recovery is still under question, and trade may suffer as Russia continues to discriminate against Belarusian goods in order to protect its market and gain the upper hand in the still unresolved oil-gas dispute. According to forecasts made by analysts of the Belarusian Institute for strategic studies (BISS), prospects for Russian-Belarusian oil and gas cooperation in 2017 look 'pretty grim'. They suggest that the conditions for the supply of oil and gas will continue to deteriorate even further. On 28 January 2017 the Deputy Prime Minister of Russia Arkady Dvorkovich announced that the Belarusian debt for gas has already reached $550mln. Moreover, the limited influence of the economic indicators in the Eurozone, USA, and China on Belarusian economy constrains possibilities of trade and economic cooperation with other countries. In this context, in January Belarusian authorities decided to accelerate the process of accession to the WTO. Chairman of the Belarusian Chamber of Commerce and Industry Vladimir Ulakhovich suggests that Belarus could join the WTO before the end of this year, as the serious barriers to this have already been removed. Belarus filed an accession application to the WTO 1993. However, due to the unwillingness of the authorities to significantly liberalise and privatise the economy, the country was not able to become a member of this club. On 29 March 2016, Alexander Lukashenko held a meeting regarding the country's engagement with the WTO and requested that the negotiating process be intensified. Thus, macroeconomic stability at the end of the 2016 is shaky. Risks for the economy lie both outside Belarus’s borders and within them. Therefore, although the government still wants to increase the tempo of reforms, including trade policy; the foreign investors – the only easy path for recovery left – will be maintaining a distance once again. On 20 January, the Belarusian jury and TV audiences selected the band Navi to represent Belarus at the Eurovision Song Contest. For the first time in the history of Eurovision, Belarus's performance will be in the Belarusian language. This is just one of many small steps that Belarus has recently taken to promote tolerance and respect for the Belarusian language. Following the Ukrainian conflict, Belarusian authorities are paying more attention to the role of Belarusian in society. Today, many Belarusians see Hrodna as a cultural capital of the country, which actively popularises the Belarusian language through the service sector. One can find ample evidence of soft Belarusisation in Hrodna cafes, shops, and the sports sphere. However, use of Belarusian will remain superficial until the language becomes equal to Russian in government, media, and education. In the 1990s, Hrodna was a hotspot for national awakening. The town had suffered from the country’s largest wave of russification; authorities closed schools, NGOs, and newspapers. Nevertheless, Hrodna managed to preserve many national traditions and institutions, including famous independent newspapers, national movements, and organisations aimed at promoting Belarusian culture, language, and history. When Lukashenka came to power, the national reawakening came to a grinding halt. The official language policy led to discrimination of the Belarusian language in favour of Russian. However, in the aftermath of Russia's aggression in Ukraine, language policy shifted to be more sympathetic towards Belarusian. This was first became evident in 2015, when Lukashenka mentioned the policy of soft Belarusisation in a public statement. Additionally, the position of the state towards history began to move away from Belarus's role as part of the Russian Empire and the USSR, focusing instead on its independence. As a result of the state's new openness towards Belarusisation, several campaigns and initiatives have emerged which aim to popularise the national language and culture. Already well-known in Minsk, language courses such as Mova Nanova are now attracting more and more students in Hrodna. The courses have existed for several years and are completely free; a single session regularly attracts 30-40 people. 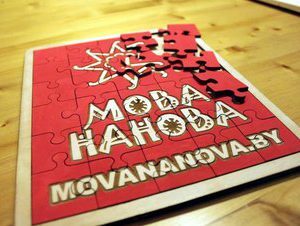 Popular musicians and writers are frequent guests at Mova Nanova, and the courses take a flexible approach to studying Belarusian, involving culture and history. Another recent campaign, initiated by Hrodna historian Andrej Vaškievič, actively affixes signs with historical names to various buildings in the city centre. The historian created a petition and submitted a proposal to the local toponymical commission, which soon approved the project. He was motivated by the need for preserving historical heritage and the Belarusian language in both Cyrillic and Latin scripts. Soon, in February or March, the historical names of 16 streets in Hrodna will be added to the buildings of Hrodna. Does the service sector speak Belarusian? In June 2016, Euroopt, one of the largest Belarusian supermarket chains, opened its first store with signs in Belarusian. The store in Hrodna is now the first large retailer in the entire country to carry on business in the Belarusian language. However, the staff can barely communicate in Belarusian, except for simple phrases. Several shops and cafes in Hrodna are trying to promote the language by employing Belarusian-speaking personnel or organising events. For example, the largest shoe store in Hrodna, as well as several underwear and sport brands, organise Belarusian culture days. One shop which particularly stands out and attracts many tourists with its hand-made souvenirs is Etnakrama, where the personnel speaks exclusively Belarusian. However, some shops and cafes limit their understanding of national identity to aesthetics. For example, the jewelry store 'B'ucik' appeared after 2014 with a Belarusian name and signs. Nevertheless, addressing sellers in Belarusian leads to confusion. One of the oldest restaurants in Hrodna, Karchma, has a traditional Belarusian name and offers a variety of national dishes. Despite this fact, the menu is only available in Russian and English, and the staff speaks Russian. When soft Belarusisation became popular for young people, several popular cafes partly switched to a Belarusian-language policy. Thus, one of the most popular cafes is now Nasha Kava; the menu is in Belarusian and staff can speak the language. This trend is also reflected by the appearance of Mova Boxes. Mova Box (Language box) is a project of the Belarusian mobile operator Velcom. The idea consists of spreading Belarusian-language books by putting them in designated boxes. Although the boxes take up little space, only a few cafes in Hrodna are supporting the campaign Moreover, cafes which do have such boxes tend to have a generally more Belarusian flavour. 2016 has also been a year for soft Belarusisation in the world of sport. In 2016, the Belarusian national football team changed its uniform; it now features the national ornament. Nevertheless, police are still detaining fans sporting non-official symbols, such as the oppositional white-red-white flag. One of the most successful basketball teams, Tsmoki, uploaded promo-video in Belarusian which quickly became popular. It seems that sports teams too are following the trend of soft Belarusisation. Nioman, a local football team in Hrodna, has also recently begun promoting the Belarusian language. For several years now, the team's social media pages have been increasingly favouring Belarusian language. Many football fans are starting to carry Belarusian national symbols to the matches. Recently, the team shared a video in which a Cameroonian player wishes citizens of Hrodna a Happy Christmas in Belarusian, pointing to the team's commitment to Belarusian-language policy. Even though Belarusian language and culture has made significant gains in recent years in Hrodna, the service sector could still do more to support the language. Cafes and shops have become the most active language promoters in the service sphere. Nevertheless, they mostly take only small steps towards Belarusisation, and their employees often have no more than a tenuous grasp of Belarusian. In an authoritarian regime, the effect of Belarusisation strongly depends on the position of Lukashenka, who seems to look more more favourably on the Belarusin cause at the moment. Further logical steps for the Belarusian cause could include introducing Belarusian education on different levels and popularising television and pop culture in Belarusian language. However, until official documents become translated into Belarusian and officials start to speak Belarusian as often as they speak Russian, the language will remain a formality. Nevertheless, an increase of positive trends in language policy is cause for optimism that the language will not be forgotten by the nation. More and more initiatives are trying to popularise Belarusian in narrow niches, such as language courses or historical projects. Getting involved in such initiatives not only contributes to preserving the language but also engages citizens.